Property Taxes are going through the roof. 30% in some areas. Is that even legal? You still think we should have bailed out those bankers/Corporations. I would have rather lived under a bridge with my fellow Americans and completely reinvent the system than bailout these elite groups only to enjoy higher taxes. Last edited by TheRifleman; 01-24-2019 at 01:04 PM. Name a place anywhere close to Boston where property taxes are 30%. I think he meant taxes have gone up 30%. The obvious question is "where and over what period of time?" In my limited experience as a homeowner, my taxes fluctuate up and down every year. Anecdotally, my property taxes went DOWN by 20% this year. Thanks Assembly Square! I think he meant taxes have gone up 30%. Proposition 2.5 makes it so that it is impossible for a city or town to raise property taxes on existing property more than 2.5% without an override voted on my the city or town. No city or town as a whole is having taxes go up that much. Some individual neighborhoods may, but that means that much of the rest of the city will see taxes go down. And in my experience, it isn't a 30% increase for anyone. Somerville's taxes for next year are $10.76/$1000 or 1.076%. The 59% rise for 4-8 family is mostly due to new construction of buildings on the larger size of that range, not reassessments of existing properties. They provide another table showing that increase in assessed value for existing 4+ family properties was only 7%. 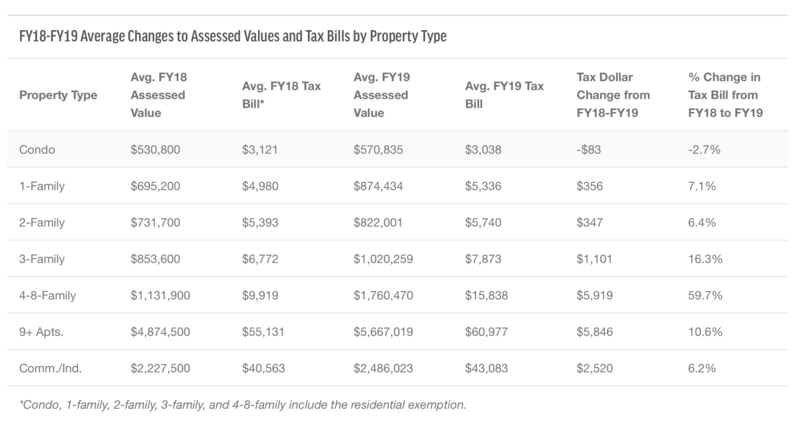 So, if you have a 3-family in the right neighborhood, maybe your tax would have gone up 30%, but that's only if you're in the correct neighborhood. And there are plenty of others in Somerville whose taxes went up much less or went down.